Sunpentown Digital Super Turbo Oven with Infrared & Wok Base from HealthyKin.com uses the newest in heating technology - a Nano-Carbon Fiber and FIR (Far Infrared) heating element. It has the capability of reaching 1832°F in one second, while traditional heating elements average 1,292°F in three minutes. Reinforced by quartz glass for fast heat conduction and radiation. Emits FIR wavelengths of 3um to 20um. Sunpentown SO-2007 is one of the first convection ovens to incorporate Nano-Carbon Fiber and FIR heating element. Due to its deep heat penetration and instant heating, food does not need to be defrosted prior to cooking. Built with two fans for quick and even heat distribution, the SO-2007 will save you up to 30% in cooking time and energy costs. 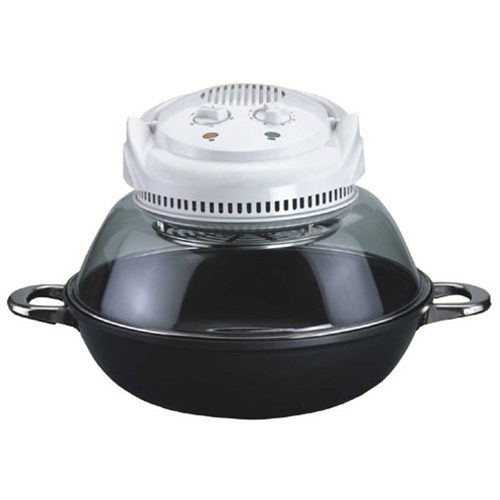 Features a wok base for versatile cooking - wok can be used on stovetop. When different cooking methods are required, no transferring of contents.